Apart from fuelling prejudices, the false reporting of the Congress manifestos by these channels has the potential to significantly shape public opinion in the run-up to voting day in Telangana. 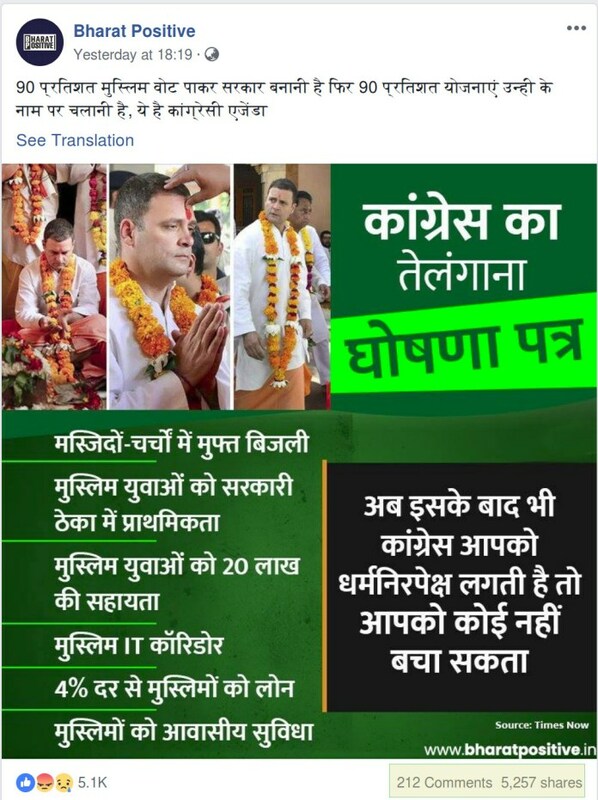 “Telangana election: SHOCKING Congress manifesto vows ‘Muslim-only schools, govt contracts’ – DETAILS”screamed the title of a news report published by Times Now on November 27, 2018. Under the, ‘religious sector’, it states that free power will be supplied to temples, mosques and churches in the state. The reports published by the stated media organisations do not mention free power supply for temples and instead focused on the reference to mosques and churches. Talking about the honorarium, Republic TV anchor Arnab Goswami in his debate said, “Masjid ke jo Imam hain unko Rs 6,000 jyada milenge. Mandir ke priest ko nahi milega (Imam of mosque will be given extra Rs. 6000. Priest of temple won’t)”. However, the report has glossed over the promises made to the youth who participated in the Telangana movement, as also the pledge for 5% reservation in government contracts for SC, ST and other disadvantaged communities. In his debate, Goswami also claimed that Congress has promised ‘Muslim hospitals’ in Telangana and the report published by the news channel stated, “Hospitals exclusively for Muslims will be established”. Nowhere, it says these hospitals are only for Muslims as claimed by several news media outlets. The news reports are inconsiderate of the several other schemes which refer to hospitals pledged to be constructed in each Mandal and assembly segment. In the debate, Arnab Goswami said, “Ghar banane ke liye Hinduon ko, Sikhon ko ghar banane ke liye loan bhi nahin milega. Yeh sirf Musalmano ko milega (Hindus and Sikhs won’t even get loans for building homes, only Muslims will)”. Moreover, it also stated, “For SC, ST families, Rs. 6 Lakh will be given for the construction of their own house.” The party has also pledged assistance of Rs 5 lakh to eligible people for construction of house on their own land. There are 22 lakh individuals eligible to get a housing unit as per the Intensive Household survey. 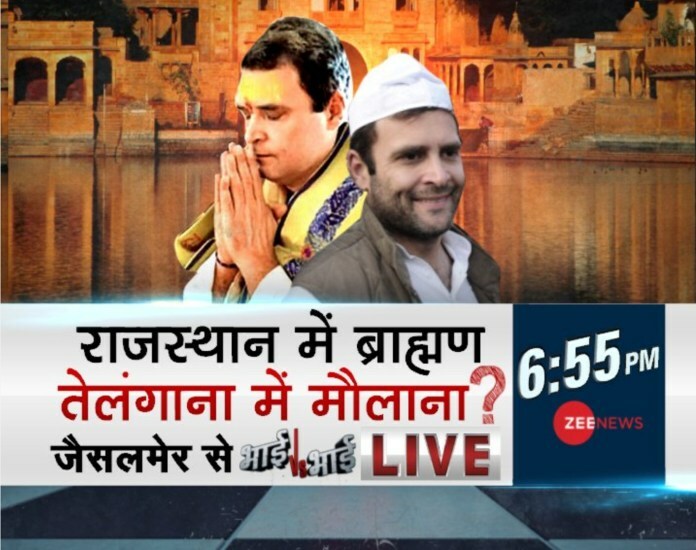 Zee News also reported with the identical narrative depicting the manifesto as Muslim community-centric. Moreover, the claims have also been echoed on social media. ‘Bharat Positive‘, a Facebook page with a huge follower base sourced the claims from Times Now. BJP MP Shobha Karandlaje from Karnataka also tweeted an image presenting the identical seven points reported by Times Now. This article was first published on AltNews. Read the original here.